The Rohde-Schwarz FSL6.06 is available to buy refurbished used or rent, usually from our UK stock. Click here to download the Rohde-Schwarz FSL6.06 datasheet. The R+S FSL is an extremely lightweight and compact spectrum analyzer that is ideal for a large number of applications in development, service and production. Despite its compact size, it offers a wealth of functions more typical of the high-end range, thus ensuring an excellent price/performance ratio. The R+S FSL is the only instrument in its class that features a tracking generator up to 18 GHz and can analyze signals with a bandwidth of 28 MHz. In addition, the R+S FSL18, which operates at frequencies up to 18 GHz, supports applications in the microwave range. The high-end approach is also evident in the operating features. When equipped with a tracking generator up to 18 GHz, the R+S FSL18 is an easily portable, microwave scalar network analyzer. As with the higher-class analyzers from Rohde Schwarz, the main functions of the R+S FSL are directly accessible by fixed-assignment function keys, with additional functions accessed using softkeys and tables. This shortens the learning curve for new users. Its compact size and low weight, plus its optional battery pack, make the R+S FSL ideal for mobile use. The R+S FSL has unique plug play upgrade abilities. All options can be added without opening the instrument. 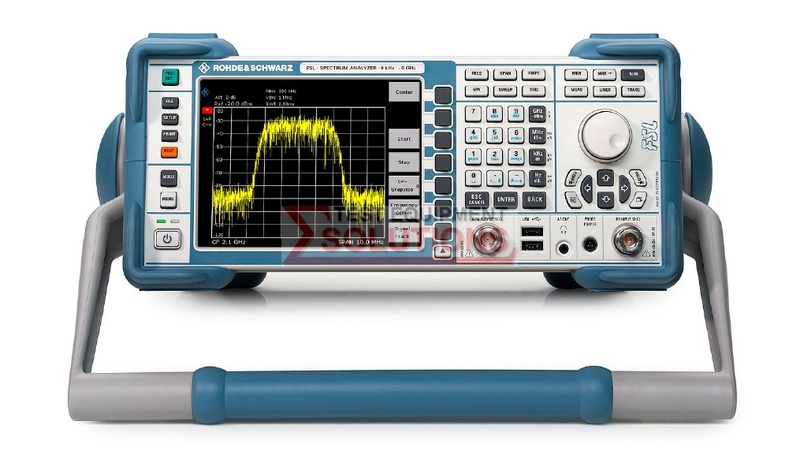 We offer the refurbished used Rohde & Schwarz FSL6.06 100KHz-6GHz Spectrum Analyser (.06 Version) for sale and rental. The Rohde-Schwarz FSL6.06 is fully tested and refurbished in our in-house ISO9001 calibration laboratory. We supply manuals, accessories, full warranty and a free-of-charge Certificate of Conformity. We can also provide the Rohde-Schwarz FSL6.06 with a fresh calibration for a small additional charge. If you have under-utilised test equipment talk to us about trading-in or part-exchanging it towards the Rohde-Schwarz FSL6.06 or other refurbished test equipment.